This ground-breaking book explores the history of the 200 Irish republican prisoners held in English prisons during the first phase of the Troubles. Their arrival into the British Dispersal System challenged a penal environment devised to cope with a relatively small number of long-term criminal inmates and became a catalyst for a range of Home Office reforms. The fact that Irish Republicans brought their war to Britain from the 1970s onwards meant that the imprisonment there of large numbers of republicans was a virtual inevitability after the Troubles erupted in 1968. Although sizeable numbers of Republicans had been either jailed or interned in the two Irish jurisdictions during the IRA campaigns of 1939-45, a prohibition on violent attacks in Britain in the 1950s by the IRA Army Council lessened the organization’s exposure to prison losses during the 1956-62 ‘Border Campaign’. Nevertheless, the latter campaign did see a number of IRA members detained in England for their efforts to procure firearms and munitions and ship them to Ireland in the 1950s. The same underground trails and contacts would be used after 1968-9 when republicans once again sourced illegal war material in Britain. What distinguished the IRA’s “Long War of 1969 to 1994 however was its intensity, the numbers involved, and the necessity it forced on both the British and Irish states to manage a new and varied prison population across three different jurisdictions of Northern Ireland , the Republic of Ireland and England and Wales. Just as this development would have a profound and lasting impact upon the penal code in Britain, so too did IRA methods of resistance adapt in accordance with the changed circumstances of their members’ captivity in the course of a protracted conflict. The incarceration of Irish prisoners in England is explored in incredible detail in this fascinating book, including the sophisticated propaganda war engaged in by both the British government and their enemies in the Republican movement. Solidarity with Irish prisoners held in English jails was an aspect of British culture with a very long-established lineage. The welfare and conditions of republicans detained in Britain had commanded the attention of solidarity groupings and pressure groups activating for these prisoners’ freedom as early as the late-1800s when the gruesome accounts of the incarceration and abuse of Fenian leaders such as Jeremiah O’Donovan Rossa in the 1860s-1880s came to the attention of well-known British-based liberals and radicals, Karl Marx and Frederick Engels included. The fatal hunger strike of IRA leader Terence MacSwiney in Brixton prison received worldwide press coverage in 1920, and the historical continuum of such tragedies only served to reinforce popular perceptions of the unduly harsh confinement of politically motivated Irishmen by an repressive Imperial power in succeeding generations. That this perspective on Irish history has always remained very much alive, albeit dormant for long periods, just beneath the surface of the Irish-British nexus, was much in evidence in January 1972 when the massacre of Civil Rights marchers in Deny and other attendant acts of violence on the part of the ruling class in Northern Ireland received global attention once more. Prior to the 1970s, it was normal for sentenced IRA men to be released within a relatively short period of the cessation of hostilities and at the announcement of a ceasefire. All prisoners serving “life” sentences were soon released once the “Forties” and “Fifties” campaigns came to an end, for example, releases that were undoubtedly aided by sustained pressure on the part of a range of groupings amnesty campaigns as organized by political prisoner solidarity groupings. The latter included comrades and sympathizers among the large Irish diaspora in Britain, the British-based Connolly Association and Irish Prisoners Welfare Committee, to name but two. What distinguished the generation of political prisoner in British prisons in the late 1960s and early 1970s, was not only their larger presence compared to previous generations of republicans but also that their arrival heralded an unanticipated instability within the British penal environment. What distinguished the generation of political prisoner in British prisons in the late 1960s and early 1970s, however, was not only their larger numerical and proactive presence as compared with previous generations of republicans but also that their arrival heralded an unanticipated instability within the British penal environment. The republican prisoners exacerbated tensions within the limited range of facilities suitable for ‘Category A’ prisoners and played leading roles in the major Hull Riot of 1976, in addition to numerous other confrontations. The detail with which the analysis of these confrontations, both propaganda-inspired and otherwise is explored marks out this book, Special Category, as the leading and most authoritative work of its kind. Drawing upon unprecedented access to participants in order to detail and analyze the phenomena of the IRA in English prisons, this volume presents extensive and new information on IRA activities within the Dispersal System, not least their planning and participation in riots and other violent actions, protests, legal challenges and escapes (both successful and unsuccessful). Included in this exhaustive study is an enormous body of hitherto-unavailable information with respect to the everyday conditions and lives of republican prisoners in Britain – their interaction with British prisoners, family visits, education, “ghosting,” (i.e. the sudden transfer of prisoners within the system) and attitudes towards prison staff – are documented in depth. Extensive use has been made of private collections of correspondence and papers, state archives, political prints, and international media reports. Account is taken of the perspective of the Home Office and British government, based on declassified documents, memoirs of key protagonists, and official records of parliamentary business. The attitude of the Irish government is also assessed. The ‘prison struggle’ in Britain differed substantially from the general experiences of republicans held on the island of Ireland, whether in Long Kesh, Armagh, Crumlin Road (aka HMP Belfast), Portlaoise, Mountjoy or Limerick. A much smaller number of Volunteers were incarcerated in Britain then in Ireland and Northern Ireland, but more controversially still was their access to visitors and the conditions under which their contact with the outside world was mediated or permitted. Over time, this contact (or lack of it) would prove a major bone of contention in England, in part because it differed to such a draconian extent from the conditions in which many republicans were held in the other two jurisdictions. While deprived of their liberty and sometimes maltreated, most republicans imprisoned in Northern Ireland between June 1972 and March 1976 enjoyed political status and its attendant privileges, which were unknown in either the twenty-six counties or in England. Predictably, when the British abolished the designation known as “Special Category” in the six counties, in 1976, it created a wave of turmoil and prisoner dissent including a focused and wide-ranging campaign of destabilization that would culminate in the seismic hunger strikes of 1980 and 1981. Comparable mass actions were never possible in England, given smaller numbers and the deployment of the draconian Prevention of Terrorism Act from November 1974 onwards. That said, what happened within the British penal system had a profound affect on attitudes and responses among republicans in both the twenty-six counties and in Northern Ireland. 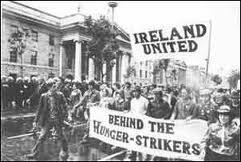 Interestingly (and tragically), the first two fatal hunger strikes of the Troubles occurred in England. Events within the ‘Dispersal System’ there would resonate strongly across both of the other two jurisdictions for decades – a fact which linked the prison “struggle” of the modern Volunteers which each successive generation of nationalist activists and agitators that had come before. O’Donnell’s writing style is fluent and succinct and he ably traces how the IRA’s post-1968 campaign evolved from an initial revolutionary phase to the grueling ‘Long War’ of the late 1970s. Republicans serving sentences in Britain came to be regarded as ‘hostages’ within this paradigm and the refusal of the British authorities to repatriate IRA prisoners from England under the provisions of the Criminal Justice Act (1961) showed that they too were particularly cogniscent of the strategic utility of the retention of prisoners and their utility as a pawn in the propaganda war. Contrast this politically inspired and discriminatory treatment with the routine transfer of convicted British military personnel and their Loyalists allies across the Irish Sea and the role of republican prisoner, both symbolic and actual, is made manifest. Often detained by their enemies with physical force and sensational press coverage, they were plunged into a shadow world in which the most basic human requirements were subject to constant threat and unequal negotiation. The public thereafter merely glimpsed snapshots of their progress through the judicial system and little or nothing of their subsequent incarceration…The use of car bombs in England from March 1973 heightened the sense of menace to the general public which was further accentuated by lurid and often inaccurate reportage of IRA activity…Court appearances during the remand phase were invariably in person in England in the 1970s, although prisoners were rendered almost invisible by oppressive security procedures and state censorship. Irish republicans, if unseen, were by no means anonymous or destined to be judged under the normal processes of criminal trials. A H-Block protest in Dublin. Both in Ireland and Britain the prisoners were part of a propaganda war during the Troubles. In retrospect, many of these dramatic spectacles should be seen a form of publicity or propaganda that sought to reassure the British public and provide the perception of large-scale state successes against its enemies. Although trial-by-jury was still maintained in accordance with legal tradition in England, it was clearly difficult for British jurors to resist drawing negative inferences regarding persons delivered to their presence by such extraordinary means. The use of ill-defined “conspiracy” legislation in England greatly lessened the prosecution’s task of presenting physical evidence in support of analysis and those convicted faced heavy sentences that were designed to intimidate and deter IRA Volunteers. Attendant restrictions on direct trial reportage and a generally-hostile mass media all functioned to create a legal climate where miscarriages of justice occurred in England with a frequency unparalleled in Western Europe. The circumstances and outcomes of many of these “show-trials” made it clear that republican prisoners in England were now regarded as a “special” sub-grouping within the maximum-security jails. This led to a strange anomaly where – despite term ‘Special Category A’ having no official status in England, since the Home Office explicitly denied the recognition of political prisoners – this same term was routinely applied by prison staff to the IRA, where the latter were generally deemed a hybrid of the “Special Category” designation applied to political prisoners in the North of Ireland after June 1972. If regarded by some as the “forgotten prisoners” due to their incarceration in numerous unfamiliar locations, the IRA in English prisons nonetheless developed a distinct profile. Republican jail resistance ranged from acts of sabotage and escape attempts to participation in some of the most serious riots in British penal history. Ironically their presence within the “Dispersal System”, then peculiar to the British penal system would serve as a catalyst for the wide-scale reform of aspects of that same system that hadn’t been changed or amended for centuries. One of the greatest strengths of this book is the fact that its author secured unprecedented access to over 120 ex-prisoners, republican activists, members of prisoner support organizations, and prisoners’ relatives who have all gone on the record for the purposes of this study. The detention of Irish prisoners in England inspired propaganda and publicity which, with the development of mass communication, disposed otherwise uninvolved persons to petition, march, fundraise, cast votes and remonstrate on behalf of the contemporary republican organizations. The exposition of this modern phenomenon as relating to the Republican movement makes this text essential reading. The second volume in this project is eagerly-awaited. 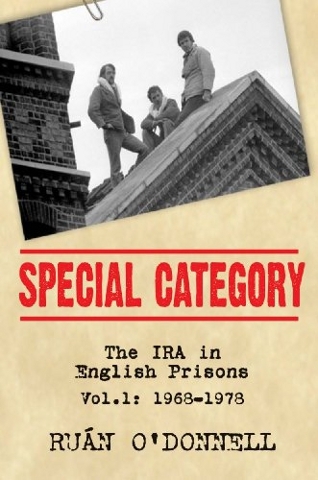 Special Category is the single most authoritative and comprehensive history of any aspect of the political prisoner experience in the modern Troubles and will remain a staple for historians of Irish history and Irish Republican history for generations to come. 4 Responses to "Book Review : Special Category: The IRA in English Prisons, Vol. 1: 1968-1978"
The IRA in Britain carried out numerous atrocities – does the book cover that? Any chance of an answer? Serious question. What right did the IRA have to kill people in pubs in Birmingham? No right whatsoever. (former Republican prisoner).